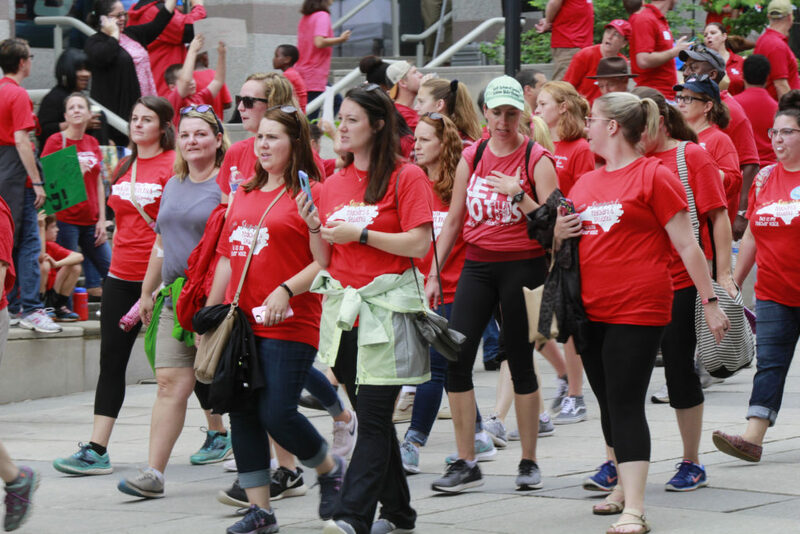 N.C. teachers protest at the May 2018 Red for Ed demonstrations in Raleigh. Before he became a household name in one of the most significant Supreme Court victories for public employees’ First Amendment rights in decades, Mark Janus was warned by his worried mother about taking on powerful union forces. “Oh, Mark, you know what they did to Jimmy Hoffa,” Janus recalls his mother telling him. Hoffa was the feared Teamsters Union boss who vanished in 1975 after a suspected organized labor hit. But Janus said he didn’t receive any direct threats before his 5-4 win last June at the U.S. Supreme Court. The landmark Janus v. AFSCME ruling said nonunion government workers cannot be compelled to pay public sector union dues. In overturning 40 years of Supreme Court precedent, the justices agreed with Janus that paying forced union dues violated First Amendment rights to association and free speech. The decision meant workers could no longer be required to pay for union activities, political campaigns, and political messaging with which they did not agree. Janus, a former Illinois Department of Healthcare and Family Services employee, now works for the Chicago-based Liberty Justice Center. He said his case gave more than 5 million public-sector union members a voice in deciding whether they want union representation. He’s helping support litigation in other states that are ignoring the ruling bearing his name. Janus discussed his case Monday in a sit-down interview with Carolina Journal, and during a public event at Campbell University School of Law sponsored by the John Locke Foundation and The Federalist Society. Brian Kelsey, senior attorney at the Liberty Justice Center, joined Janus in the Campbell presentation. Janus said it’s unacceptable that public employee unions amass billions of dollars nationwide including forced collections, yet lack transparency about how the money is spent. He objects to the corrupting influence of union leaders using dues to fund election campaigns for government officials with whom they will negotiate their own contracts. Kelsey, who did his undergraduate work at UNC-Chapel Hill, said government unions are among the nation’s most overtly political organizations. He praised Janus for having the courage to stand up to the American Federation of State, County, and Municipal Employees, which in Illinois has 35,000 government union members. Despite the Janus victory, Liberty Justice Center must continue defending it in a number of states trying to skirt that ruling. Some states use gimmicks. One imposes a narrow time frame letting an employee ask to opt out of the forced payments. If the request isn’t received in time, the employee must wait another year for that window to reopen. Some employees have filed the paperwork, only to see it mysteriously returned and then told they can’t refile because they missed the deadline. Some states now pay the dues — euphemistically called agency fees or fair-share payments — directly to unions instead of deducting them from employee paychecks. But they payments are still considered part of the employees’ salary. In some cases, unions are trying to settle out of court for back dues with government workers who filed lawsuits for noncompliance. Unions don’t want to risk another court decision against them, Kelsey said. Government unions have said they should be able to collect agency fees, which allegedly cover only operating costs and can be separated from money funding political activity. Justice Samuel Alito, writing for the Janus majority, conceded the point. But he said protecting employees’ First Amendment rights was more important than keeping government unions solvent. The Janus decision applied to 22 states, mostly in the Northeast, in the upper Midwest, and on the West Coast, Kelsey said. North Carolina is a right-to-work state and doesn’t allow collective bargaining by public employees. It should be unaffected by the Janus decision. But there are indirect implications. He cited the teacher walkout at the beginning of this school year, calling it a strike even though public-employee strikes are illegal in North Carolina. Kelsey said he was willing to bet union members from other states, paid with money raised by tax-funded dues, were transported to North Carolina to participate in the protests. Janus said the state deducted about $60 a month from his paycheck to fund a union he didn’t want to join. Besides that, the union promoted positions with which he disagreed. Political activity comprised about 80 percent of the union’s actions. He said legally the union was supposed to give him a statement annually explaining how dues were spent. He received only one, and it was so confusing he couldn’t determine what activities were funded. When he filed his lawsuit he didn’t expect it to become a milestone First Amendment victory.